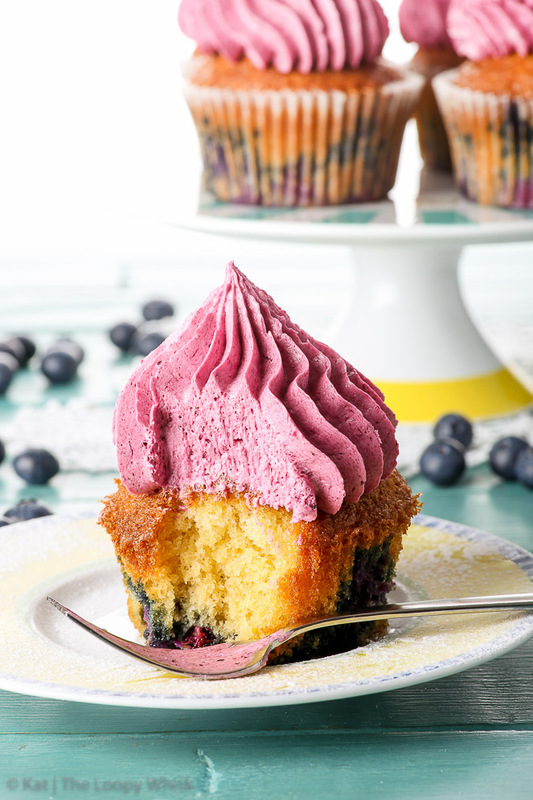 These amazing blueberry cupcakes with blueberry buttercream are guaranteed to impress. The recipe is quick and easy, but the results are mind-blowing! All you need is half an hour and minimal piping skills. 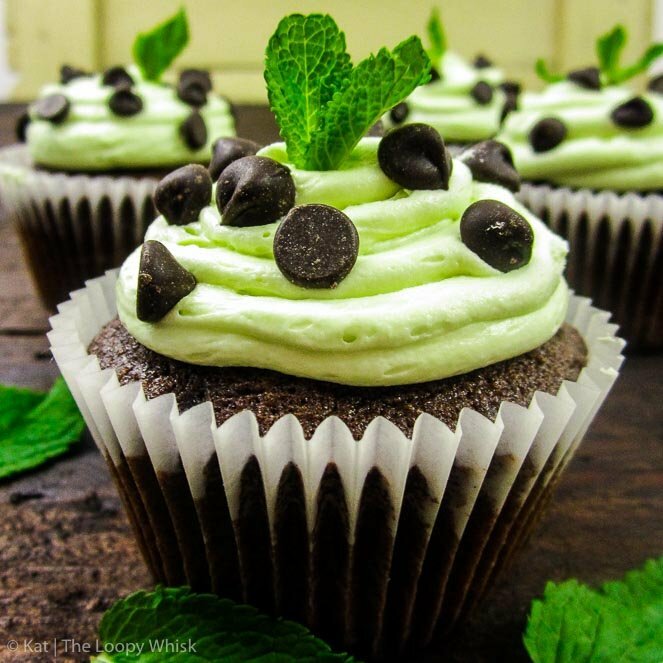 The cupcakes have the perfect ratio of creamy buttercream to fluffy cupcake, and the blueberry flavour comes through in every bite. 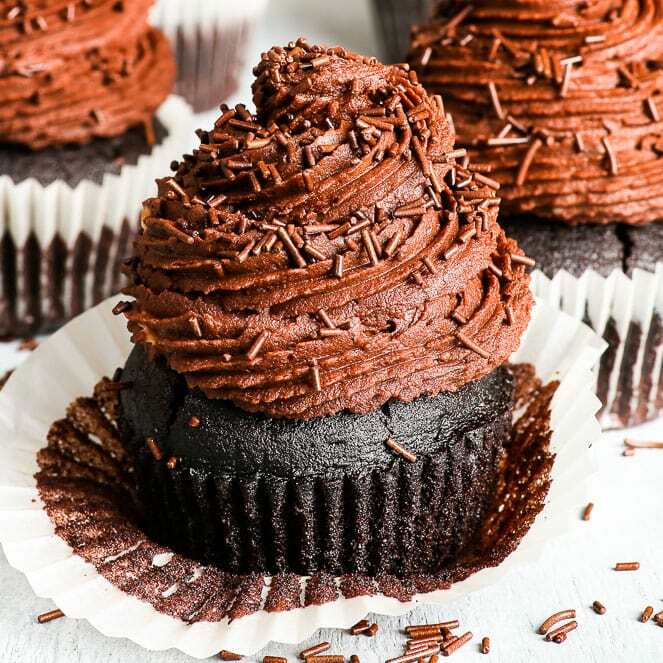 I’m sure I’ve said it before, but cupcakes are awesome. They are these little heaps of everything cute and dainty and sweet (in every sense of the world), and they are the best dessert if you want to impress everyone. 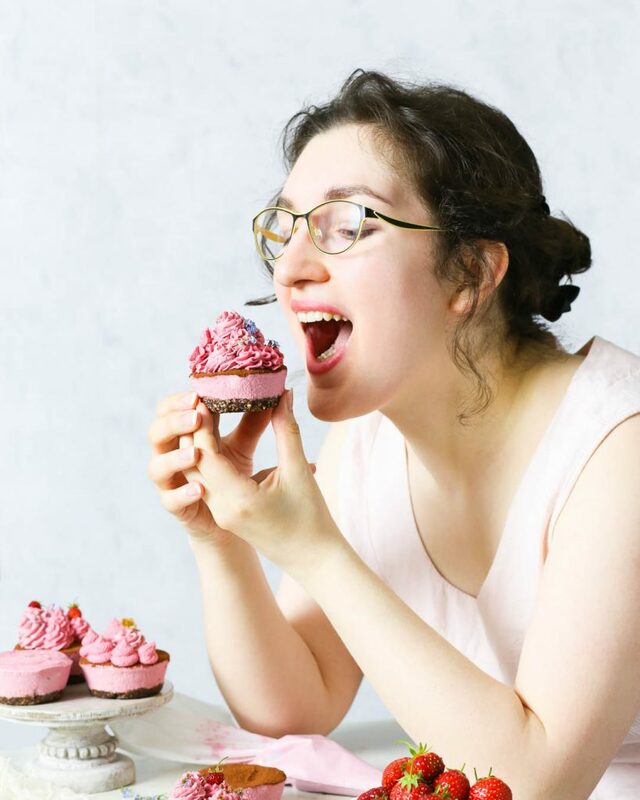 Cupcakes get all of the “Ohh”s and “Ahh”s out of people, with quite a few “Wow”s and “You’re so talented!” thrown in. All you have to do is stand there and preen in a vaguely modest way. Practice your pleased humble-brag face. 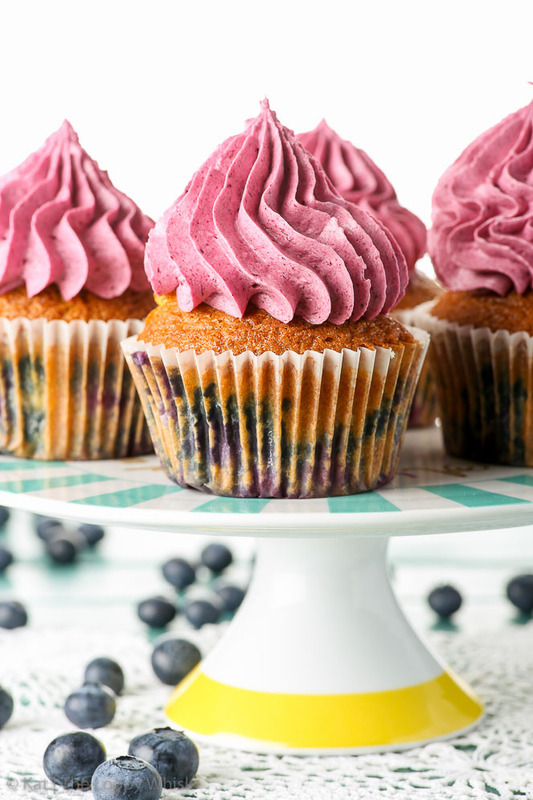 You’ll need it, especially if you make these amazing blueberry cupcakes with blueberry buttercream. 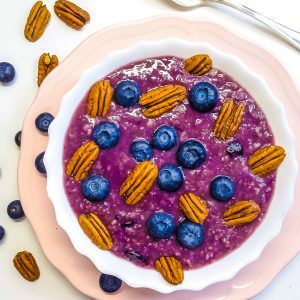 Yep, we’re totally rocking that blueberry vibe. There are many things that these blueberry cupcakes get right. The fluffiness of the cupcakes. The creaminess of the buttercream. The bursts of blueberry flavour in every bite. The perfect ratio of buttercream to cupcake. The beautiful colour of the buttercream (all natural!). The effortless yet elegant appearance of the piping. 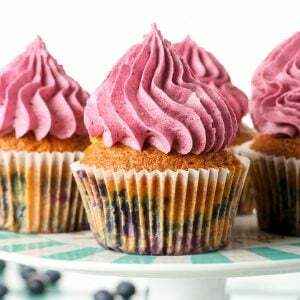 And – wait for it – this blueberry cupcake recipe is incredibly easy and quick! I know I say that for every recipe… but it’s 100% true! 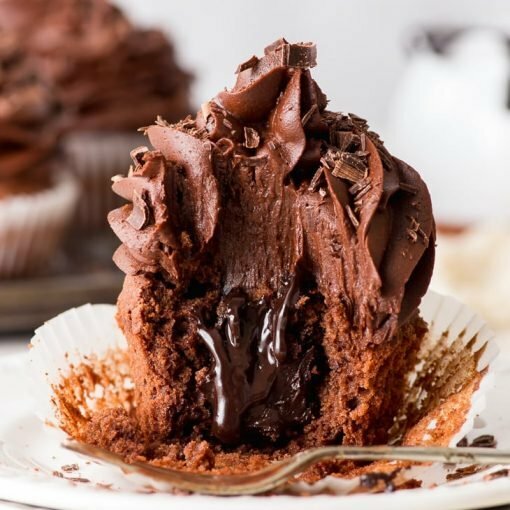 You just mix all the cupcake ingredients together, spoon the batter into the cupcake cases and bake for about 20 minutes. 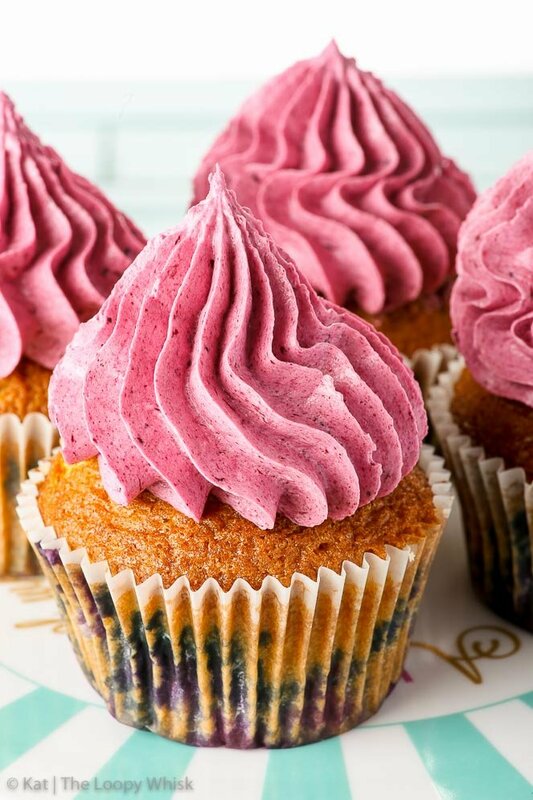 In that time, you can prepare the blueberry puree-reduction-thingy, whip up the buttercream and be prepared for the ready-set-go decoration. It’s express baking, what we’re doing here. 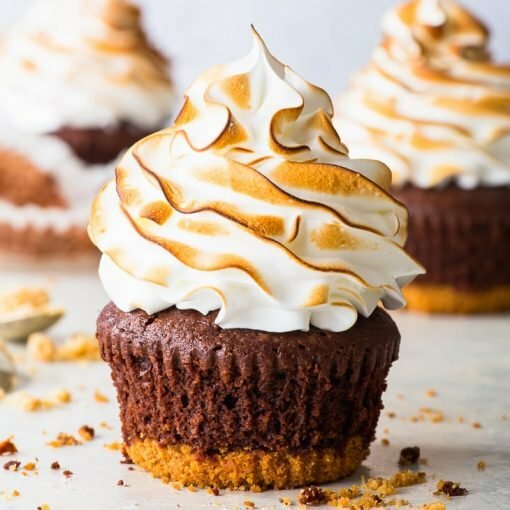 The piping may seem ultra sophisticated and whatnot, but it’s actually just squirting a bit of buttercream on top of the cupcake. Literally, that’s it. Really. The result is so beautiful and refined because the piping nozzle is huge – it’s a 18 mm open star nozzle, and it makes pretty much anything look amazing. This piping pattern doesn’t require much skill. If you know how to hold the piping bag vertically and squeeze it, you’re good to go. 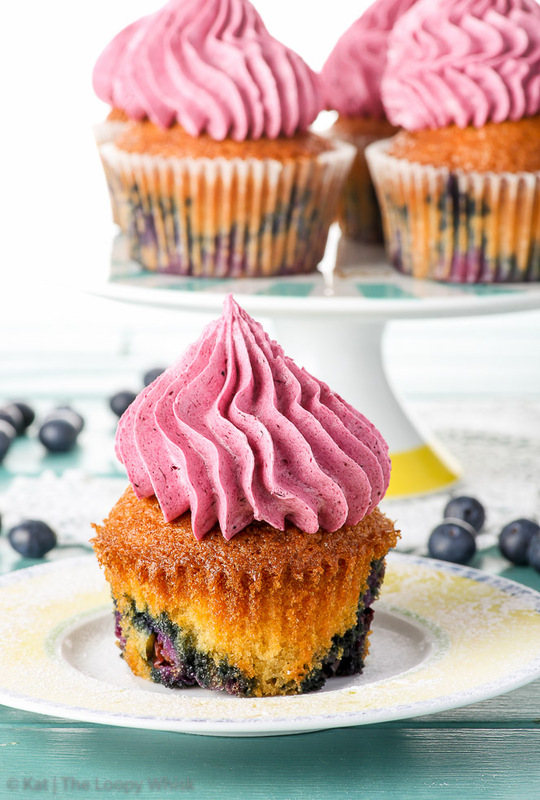 So there you have it – a ridiculously easy blueberry cupcake recipe that will convince everyone you’re a professional baker and have been slaving away in the kitchen for hours. When, really, it took you half an hour and minimal skill was required. But shh, that’s for us to know and for others to be impressed. P.S. There’s a gluten free option in the recipe below, as well! Pre-heat the oven to 180 ºC (350 ºF) and line a cupcake baking tray with 12 cupcake cases. In a bowl, mix together all blueberry cupcake ingredients except for the blueberries. Mix until a smooth batter forms, but do not over-mix. Fold in the blueberries until they are evenly distributed. Using an ice cream scoop or a spoon, fill the cupcake cases about 3/4 full with the cupcake batter. Bake in the pre-heated oven at 180 ºC (350 ºF) for about 20 minutes or until golden brown and an inserted toothpick comes out clean. Remove the cupcakes from the cupcake baking tray and allow to cool before decorating. In a saucepan, bring the blueberries and lemon juice to a boil. The blueberries will soften and release their juice. Simmer until the juice is significantly reduced in volume and a thick, jam-like consistency is reached (about 5 – 10 minutes). Pass the cooked blueberries through a sieve to remove their skins. Use a spatula or spoon to press the blueberry "jam" against the sieve so as to extract all of the reduced juice. Allow the reduced juice to cool completely before adding it to the buttercream. If it is too warm, it will melt the butter, which you most definitely don't want. Using either a hand mixer with the beater attachments or a stand mixer with the paddle attachment, beat the butter until pale and somewhat fluffy. Add 1/2 of icing/powdered sugar and beat the butter/sugar mixture on medium to high speed for about 5 minutes. Add the remaining 1/2 of icing/powdered sugar and beat the mixture for a further 10 minutes (5 minutes medium speed, 5 minutes high speed). At this stage, the buttercream should be very pale, creamy and fluffy. Add the cooled reduced blueberry juice, all at once, and beat the buttercream at high speed for 1 minute. Using a spatula, scrape along the mixing bowl walls to check that all of the blueberry juice has been incorporated. If it hasn't, mix again for 1 minute. Note 1: Coating the blueberries in flour ensures that they don't all sink to the bottom of the cupcakes. 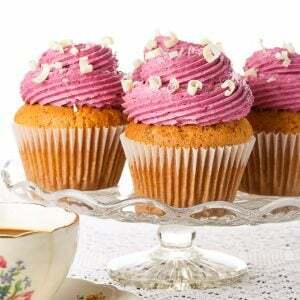 Note 2: To achieve the piping decoration as in the pictures above, keep the piping bag vertically above each cupcake. Start piping so that the nozzle is about 1 cm (about 1/2 inch) above the cupcake, and then slowly raise the nozzle as you continue piping. When the buttercream is at the height you want, stop piping and quickly "pull" the nozzle up to get the sharp peak on top.Ta-da! 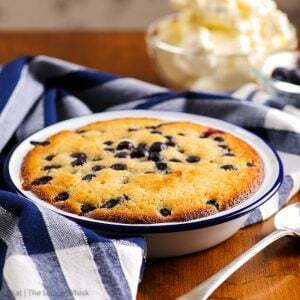 Looking for more blueberry yumminess? You’ve come to the right place! Hi Vicky! Sorry to hear you’ve had problems with the recipe. Have you reduced the blueberries until they were jam-like in consistency? It shouldn’t be liquid at all, more like a loose jam. Hope you give this recipe another try!